This week on The Digital Story photography podcast: Special Edition Nimble Holiday Gift Guide for Photographers. I'll discuss 10 affordable items that are sure to please the photo hound in your life. All of this and more on today's show with Derrick Story. The Eye-Fi Mobi 16GB SDHC Wireless Memory Card ($67) - Even though we wish every one of our cameras had built-in WiFi, the fact is many don't. The Mobi is the best accessory solution I've used so far. Background article: Eye-Fi Mobi Review. The nifty lens case is designed for rapid exchange so you can take out your lens with one hand, replace it on your camera, and store the removed lens. The interior of the case has a dual compartment design that holds two lenses while the case is open but will not close with both lenses inside. 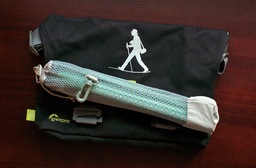 Comes with belt attachment and a very nice strap. 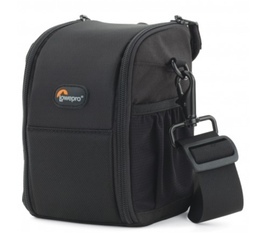 Purchase: Lowepro S&F Lens Exchange Case 100 AW. Background article: Need a Spare Hand? Lowepro Lens Exchange Case 100 AW. I was skeptical until I actually started carrying one around. 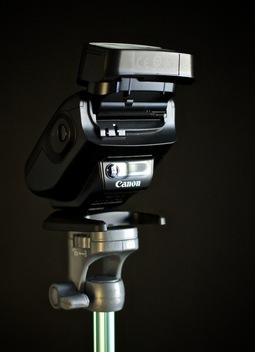 I've used the Lollipod as a light stand, microphone holder, and camera support. It looks cute, packs light, and would delight just about any light-footed photographer. Purchase: Lollipod from its creators in the UK. Background article: Is the Lollipod Really Useful? This will make your life easy. 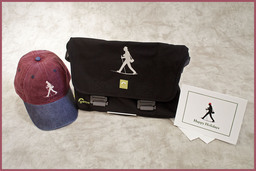 This Nimble Gift Set includes the black Walking Man Shoulder Bag with embroidered Nimble Photographer, a stainless steel Wenger 26-ounce water bottle (that fits in the bag), two artisan gift cards, and a holiday gift bag. All you have to do is sign the card and hand over the gift. Appreciated by travelers and photographers alike. This little gem features a stainless steel micro positioning ball that allows for 36Â° of movement in any direction for precise control in photo or video composition for cameras weighing up to 1.76 lbs. I keep one with me at all times, and just love it. I love working with disc reflectors, but I don't always have an assistant to hold them for me. I found the Flashpoint 24" Triangular Collapsible Disc that has a rigid design and can be held by one hand. It's silver on one side, providing lots of fill light. And on the other side it has black, white, and gray segments that can be used for establishing exposure and for color balance in post. Background article on Flashpoint reflector. If you like pancake lenses, you're going to love this. The just-announced Olympus BCL-15mm f8.0 Body Cap Lens is literally the size of a body cap, yet transforms to become a fixed focus snapshot lens that's a blast to shoot with. The lens is just 9mm thick, and when the cover is in place (to protect the glass), it looks like a body cap for your micro four thirds camera. 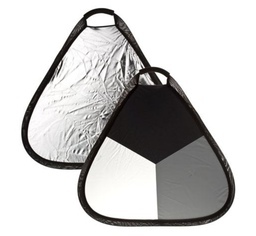 Anyone who uses an external flash will appreciate this nifty diffusing accessory (that really works). I like that it fits just about anywhere in my camera bag. And it really improves portraits captured with flash. After a year of shooting with the Canon 40mm EF f/2.8 STM lens,I have to say this is one enjoyable little prime. At half the size of the 50mm f/1.8, it focuses quieter, is built sturdier, and is ever bit as sharp. Plus it hardly takes up any room! Background article on Canon 40mm pancake lens. This will bring a smile to any photographer's face: Their own "Parking Only" sign complete with Violators Will Be Shot warning. In addition to subscribing in iTunes, you can also download the podcast file here (28 minutes). You can support this podcast by purchasing the TDS iPhone App for only $2.99 from the Apple App Store. Photo Assignment for November is Critters. SizzlPix! - For The Digital Story Virtual Camera Club members ... if you'd like additional copies of for gifts, or SizzlPix! of any other of your images to make spectacular, amazing holiday gifts, order any two SizzlPix! to be shipped together, and we'll give you 25% off on the second one! Order any size up to a mind-boggling 48 by 72" Imagine -- six feet! and no sacrifice in resolution, luminance, and impact. Just put "TDS " in the comments space on the sizzlpix.com order page. Of course, you may apply the discount to any number of pairs. And free shipping to any US mainland address. This week on The Digital Story photography podcast: Is the iPad mini Retina worthy for photographers? On the Nimbleosity Report - A week with the Lollipod ultralight accessory stand. ; From the Photo Help Desk - Are soft backgrounds possible with micro four thirds cameras? All of this and more on today's show with Derrick Story. Story #1 - Is the new iPad mini worthy for photographers? The much anticipated Retina display mini is now available. It sports a brand new display weighing in at 2048x1536 resolution at 326ppi. But it seems to generating its share doubts from the photography community. Starting with reports of possible burn-in on some models, to criticism about its more narrow color gamut. I've tested a brand new iPad mini with Retina display against the original iPad mini, an iPad 3, and iPhone 5S. Here's the way things stack up. The new iPad mini screen is brighter, sharper, and has better contrast than the original iPad mini. Compared to the iPad 3 and the iPhone 5S, the new mini has less saturated colors, especially the reds and purples. The color temperature for the new iPad mini is more pleasing to my eye than the original iPad mini, and to a small degree, the iPad 3. I haven't been able to test the new iPad mini against the iPad Air. Reports are that the color gamut displayed by the Air is better than the new iPad mini. I would tend to believe this because the iPad 3 has a broader gamut too. 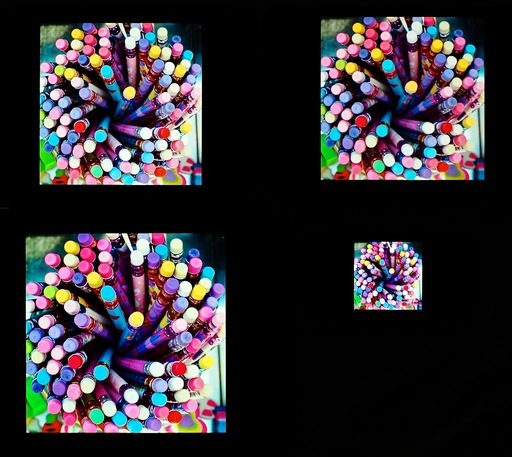 Upper Left: iPad mini with Retina Display; Upper Right: iPad mini; Lower Left: iPad 3 with Retina Display; Lower Right: iPhone 5S with Retina Display. So, is the iPad mini with Retina Display a worthwhile investment for photographers? I delve into the details in the first segment of today's show. Story #3 - Are soft backgrounds possible with micro four thirds cameras? In short, yes	. And I explain how in the third segment of today's show. For The Digital Story Virtual Camera Club members ... If you'd like additional copies of for gifts, or SizzlPix! of any other of your images to make spectacular, amazing holiday gifts, order any two SizzlPix! to be shipped together, and we'll give you 25 percent off on the second one! Order any size up to a mind-boggling 48 by 72" Imagine -- six feet! and no sacrifice in resolution, luminance, and impact. Just put "TDS" in the comments space on the sizzlpix.com order page. Of course, you may apply the discount to any number of pairs. 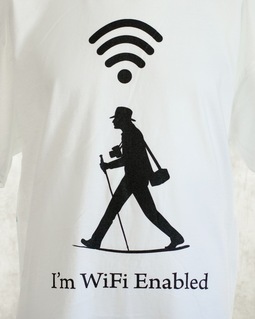 And free shipping to any US mainland address. In addition to subscribing in iTunes, you can also download the podcast file here (31 minutes). You can support this podcast by purchasing the TDS iPhone App for only $2.99 from the Apple App Store. This week on The Digital Story photography podcast: Nikon Df mechanical/digital DSLR; on The Nimbleosity Report - Olympus Stylus 1; From the Photo Help Desk - Do I need expensive filters? All of this and more on today's show with Derrick Story. Story #1 - Nikon Df DSLR - What started in the Scottish Highlands with an excellent teaser video has now become a reality. And it has a lot of photographers excited. The Df will be available in silver and black, probably around the end of this month. It looks awesome. The Df has that throwback styling that made the original OM-D so alluring. It even has the "slide over" eyecup shade for long exposures. 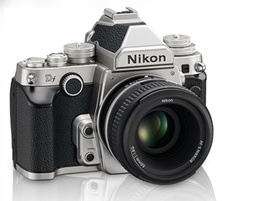 If you want one for yourself, it will cost you $2,996.95 with 50mm lens. I talk about the possible impact of this camera in today's top story. This looks like a heck of an all-in-one camera to me. Love the constant aperture and zooming range. Lots of enthusiast features in a very nimble package (14 ounces). This little gem will set you back $699 US. Is it worth it? I'll talk about that. Story #3 - From the Photo Help Desk - Should you pay the extra dollars for high-end multi-coated filters when others are available at a fraction of the price? Now is the time to order your SizzlPix for the holidays! New Ad tiles on TDS. If you're going to purchase from Amazon of B%H Photo, please click on the respective ad tile for those suppliers, located in the second column on every page of TheDigitalStory.com. And don't forget, I have an Aperture Workshop coming up on Nov. 16 and 17. Write me at derrick@thedigitalstory.com for more details. This week on The Digital Story podcast: New Photography Workshops for 2014; The Nimbleosity Report -- Has the Canon G-Series run its course? 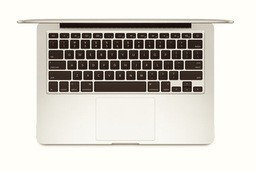 From the Photo Help Desk -- Which New MacBook Pro Laptop is Best for Photographers? All of this and more on today's show with Derrick Story. Story #1 - New Workshops for the Coming Year - I've been working on the 2014 workshop season for a while now, and I think I have a very tempting line up. High School Senior Portraits, Inside and Out - Feb.
Fall Color with Safari West - Oct. I talk about these events in the first segment of today's podcast. 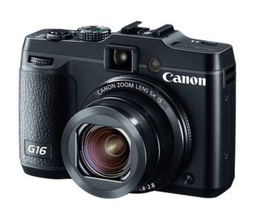 Story #2 - Nimbleosity report on the Canon PowerShot G16 - Has the G Series run its course? I cut my teeth on digital photography with the Canon G1 and G2 cameras. I still have them. But as I've compared the latest member of this family to the competition, I'm wondering if the G Series has finally run out of gas. I go into detail in today's Nimbleosity Report. I compared the G16 to a direct competitor, the Fujifilm X20. The results were interesting. They both weigh about the same. The X20 has the edge in image sharpness, sensor size, AF speed, and burst mode. The G16 has better spec for the LCD monitor, 240 fps video recording, and longer battery life. Plus the G16 includes built-in WiFi costs $50 less. So is the G16 a worthy competitor? I answer in today's show. And don't forget to visit the official Nimble Photographer web site. Story #3 - From the Photo Help Desk: Which of the new MacBook Pros are best for photographers? Now that Apple offers Retina Displays for both the 13" and 15" models, which is best for photographers? Three considerations: 1) Budget: 13" runs from #1,299 to $1,799 while the 15" runs from $1,999 to $2,599. 2) Portability: which laptop fits in your ideal carrying solution? 3) Applications you use: the $2,599 MBP has both Intel Iris Pro Graphics and NVIDIA GeForce GT 750M graphics card. The 13" has Intel Iris Graphics. Photoshop and Aperture can take advantage of GPU acceleration. Lightroom does not. I sort this out in the third segment of today's show. If you have a question for the Photo Help Desk team, visit PhotoHelpDesk.com. Chuck Jones is the winner of the Nimble Photographer T-Shirt giveaway. He wrote, "I think my favorite item in the store is the cap. All of the items look great, but I wear caps all the time and this one has a classic look to it." Thanks Chuck for your feedback, and I hope you enjoy the T-Shirt. The October 2013 photo assignment is "My House is My Castle." This week on The Digital Story photography podcast: Sony drops the full frame bomb with the a7; The Nimbleosity Report - Panasonic's diminutive GM-1; From the Photo Help Desk - How can I repair a scratch on my camera's LCD screen? All of this and more on today's show with Derrick Story. Story #1 - Sony's full frame a7 - Now you can have your compact system camera and full frame sensor too. As early as November, well-heeled shooters will be able to order the Sony Alpha a7 Mirrorless Digital Camera with FE 28-70mm f/3.5-5.6 OSS Lens for $1,998. More lenses are promised, although they will not be cheap. A few drawbacks to consider. Oddly enough the a7 does not ship with a battery charger. You have to recharge in-camera. The new FE lenses would be available for months, and when they are, they will be pricy: (FE 35mm F2.8 ZA $799.99, FE 55mm F1.8 ZA $999.99, FE 24-70mm F4 ZA OSS $1,199.99 (coming in early February), FE 28-70mm F3.5-5.6 ZA OSS $499.99, FE 70-200mm F4 OSS G (Pricing and release date TBA). And even though you can you existing E-mount lenses, they will only work in a crop mode on the A7/A7r, since they were not designed to cover a full-frame sensor. Story #2 - Nimbleosity report on the tiny Panasonic GM1 mirrorless M 4/3 camera with 12-32mm Lens ($749). Amazing, roughly the size of the Sony RX100 compact camera, this little guy is the smallest micro four thirds camera to date. But there are tradeoffs for this pint-sized wonder. Top shutter speed is 1/500th, no in-body image stabilization, no 1080p video, so-so battery life, no option for electronic viewfinder, and no hot shoe. Personally, I'd much rather have the Panasonic GX7, even though it costs $250 more, the feature set is much more appealing. Story #3 - From the Photo Help Desk: How do I mitigate a scratched LCD on my camera. I have a home brew recipe to help. This week on The Digital Story photography podcast: Pentax's crazy K-3 DSLR, The Nimble Photographer lives, Easy hair light for portraits - All of this and more on today's show with Derrick Story. What don't you get? There's no built-in WiFi and the LCD does not have touchscreen capability. Story #2 - The Nimble Photographer Lives! What started as a fun idea into 2010 has now become a full-blown website and community. Today is the debut of thenimblephotographer.com. The site features a Journal with comments, a store for Nimble photographer gear, Walkabout for photo sharing, Fit Kits to take you inside the nimble photographer camera bag configurations, and believe it or not, more. I tell you all about it in the second segment of today's show. Story #3 - Easy Hair Light for Portraits - Adding a highlight to the hair gives that professional touch to portraits. But controlling the amount of light is not always easy. After lots of experimentation with just about every technique available, I have settled on a handy variable controlled LED light for hair lights. You can see an example of this technique here. I explain in the third segment of today's show. This week on The Digital Story photography podcast: Adobe hacked, Cloud services for your photos, and How to Brighten Teeth - All of this and more on today's show with Derrick Story. Story #1 - Adobe Hacked - Recently, attackers removed from Adobe servers certain information relating to 2.9 million Adobe customers, including customer names, encrypted credit or debit card numbers, expiration dates, and other information relating to customer orders. What does this mean for Adobe customers and Cloud-based services in general? Story #2 - Cloud Services for Your Photos - Interesting topic in light the Adobe hacked story. After lots of testing, I'm still of the belief that the best backup system is the one you set-up and forget about. I share my experiences with Apple's Photo Stream, EverPix, and Dropbox's latest feature, automated backup of your iPhoto library. Story #3 - Tooth Brightening in Post Production - Brightening someone's smile is one of the nice things that you can do for your subjects during image editing. For best results, a light touch is required. In the third story I share my tips for an attractive, natural smile. In addition to subscribing in iTunes, you can also download the podcast file here (37 minutes). You can support this podcast by purchasing the TDS iPhone App for only $2.99 from the Apple App Store. This week on The Digital Story photography podcast: The new Lowepro Urban Reporter photo bag, Does the iPhone 5S camera live up to its hype?,and Ziploc bags - All of this and more on today's show with Derrick Story. Story #1 - The Lowepro Urban Reporter 150 camera bag is my current favorite compact system camera bag, and I love the Urban Reporter 250 for my DSLR kit. Both bags have soft texture fabric exteriors, leather touch points, and metal hardware. They are light, comfortable, and wonderfully designed for the Nimble Photographer. I go into detail in today's second segment. Story #2 - Is the iPhone 5S camera worth getting excited about? After a week of shooting, my opinion is that the iPhone 5S camera lives up to the hype. Here's what's impressed me. User interface - The powerful hardware combined with the new Camera app in iOS 7 is a winning combination. The camera is just so easy to use. Slow Motion Video that really works. Not only on the iPhone itself, but you can publish it to YouTube or incorporate in iMovie projects. Amazing Panoramas - The dynamic exposure panorama capability automatically calculates and adjusts exposure variations across the scene as you capture the panorama. This leads to stunning images right out of the camera. True Tone Flash - the iPhone 5S sports two LEDs, one white and one amber, and they are used in varying degrees to create natural coloration under a variety of conditions. And it works. Fast performance - Press the home button, swipe upward and tap the camera icon: you're ready to shoot in about a second. Focusing is fast, and burst mode is blazing. Everything happens quickly with this camera. It's Fun - I know this sounds like a weird feature, but the iPhone 5S is flat out fun to shoot with. Great performance, fun features such as filters and slo mo video, and instant results. Slow motion video capture with iPhone 5S. No wonder compact cameras are struggling. Story #3 - Why you should carry a Ziploc bag in your camera kit. It's probably one of your least expensive photo accessories, but it can save you in so many ways. I explain why in the third segment. This week on The Digital Story photography podcast: iOS 7 for Photographers, Photo Help Desk: MacBook Pro or Mac Pro?, and a helpful focusing tip - All of this and more on today's show with Derrick Story. Photos app: Panoramas Album. My iPad culled all the available panoramas I had captured and placed them in a new Album titled, Panoramas. 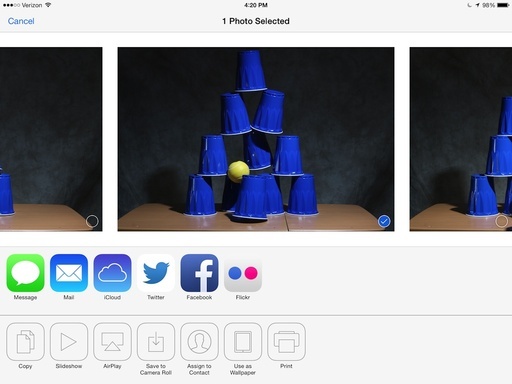 Photos app: Fast sharing of images from inside the Photos app. Tap on the blue arrow icon in the lower left corner to reveal a plethora of sharing options. I've been tweeting images from inside the app. Photos app: Years, Collections, Moments. The Photos app brings much improved organization by creating collections that can be viewed by year all the way down to "moments" that are photos taken within a day. And of course, those "moments" can be shared. Very helpful! 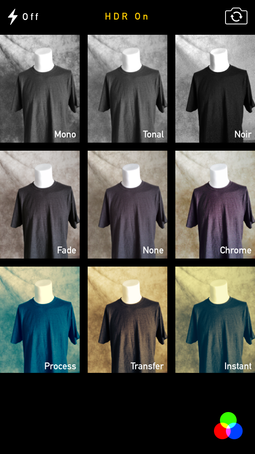 Photos app: Filters.In the Edit mode, you now have filters to play with. And what I like about them, is that they include B&W and faded conversions. So you can shoot in color, but make gorgeous B&Ws right in the Photos app. Plus the effects are nondestructive. So you can always revert to the original. Camera app: Continuous Shooting Mode. This even works on my iPad 3. Hold down the shutter button and the app will capture in burst mode. Camera app: Square format. For those of us who like to share on Instagram, having square format at capture really helps to compose the shot properly. Story #2 - Photo Help Desk: MacBook Pro or Mac Pro for my next computer for photography? Story #3 - Shooting Tip: Manual focus mode is helpful for a variety of shots, especially when you want one particular thing in focus, and you don't want your camera to refocus when you press the shutter button. One trick that I use is to focus on the element I want sharp, then carefully switch to manual focus so the camera doesn't refocus when I take the shot. The September 2013 photo assignment is Grab Shot.